TNT Express is one of the world’s leading courier delivery services, operating in over 63 countries across the globe. TNT is short for Thomas Nationwide Transport, Thomas being the surname of the company’s initial founder, Ken Thomas, who set up a small transport business using just one truck in Australia in 1946. 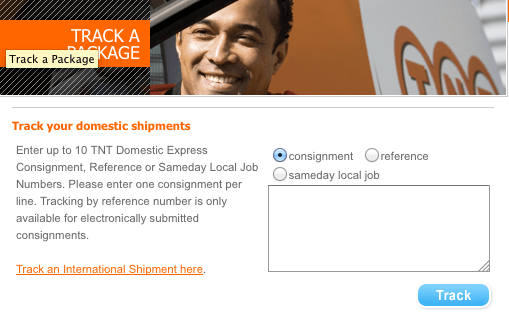 Tracking packages sent via TNT can be done online or on the phone in a few simple steps. As long as the consignment number is to hand, customers are able to track the progress of their shipments in detail, from collection right up to delivery, where the signature of the recipient is viewable along with specific times and locations. This allows businesses to keep their clients up to date with the whereabouts of any packages and provide accurate details. Domestic shipments are traceable online using the Track n Trace shipping tool, where customers or recipients must enter the consignment number or customer reference number on their accompanying paperwork or booking confirmation. Up to 10 different consignments or references can be tracked at a time. International shipments can be tracked in the same way online. TNT use advanced electronic solutions to provide the very best tracking for their customers, with high end tracking products that cover a whole host of devices. As well as the general online Track n Trace service, regular customers have access to an additional tracking service through the myTNT shipping management tool. SME’s can use the ExpressShipper, a PC based tool, with ExpressManager and ExpressConnect offering similar solutions to other customers. Tracking is also available by email and SMS, so businesses and everyday customers can check the status of their shipments without actually browsing the web. Email tracking is available by emailing the letter ‘C’ followed by the consignment number, or ‘R’ followed by the customer reference, to track@tnt.co.uk for UK shipments, or track@tnt.com for international shipments. Emails must finish with the word ‘END’ in order to be received and processed successfully. Little did Thomas know that his little venture would turn into the mammoth that is TNT Express today, a multi billion pound company that dominates the logistics industry on an international level. What started as a incredibly humble affair soon became something of a force to be reckoned with, growing considerably throughout the 1960s. In 1961 it had become such a huge success in Thomas’ home country of Australia that it was put on the Sydney stock exchange. The company began to branch out from Australia and New Zealand and became increasingly established across the globe by the 1970s and 1980s. 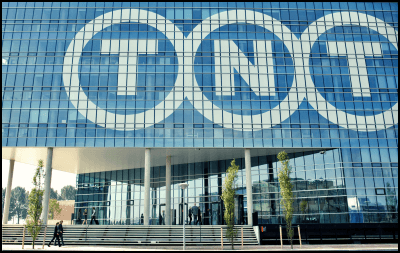 By the 1980s, TNT began to focus on Europe, where it succeeded in achieving further growth, with its employee number totalling 70,000 by the 1990s, when it was acquired by a Dutch postal service company who enabled additional expansion. After a slew of investors, acquisitions and changeovers, with various different people becoming involved in running and merging the company, TNT eventually became a standalone company in 2011, when it de-merged from its parent company. TNT Express was listed on the stock exchange in 2011 after de-merging from TNT NV. Since then, several attempts have been made to acquire the company by the likes of rival logistics corporations such as UPS, however none have been successful. The UPS attempted acquisition was famously blocked by the Europeon Commission under anti-competition legislation. Today, it is widely considered to be amongst the best and most reliable delivery services in the world, specialising in express delivery, security and international operations. With road and air transportation systems operating all over the world, in areas including the Middle East, Europe and Africa, it is able to provide exceptional international delivery options as well as an impressive and competitive domestic service. In the UK and Ireland, the company TNT Express Services UK & Ireland employs over 11,000 people in its 70 depot centres. Together, the TNT workforce deliver over 100 million packages per annum for businesses alone. The company has won a number of awards for its high quality service, including the Excellence in Service Logistics Award from Cisco and Road Supplier of the Year from Ceva Logistics. Its CEO was awarded the SAM and SPG Sustainability Leader Award in 2010. The company’s annual turnover exceeds £880 million. In 2013, its annual turnover was €1.70 billion, and in 2012 it totalled €1.79 billion. Its first quarter annual report for 2014 a revenue shrink of 6.6%, falling to €1.6 billion from 2013’s €1.72 billion. Its operating income has also shown decline, going from €219 million to €17 million, however its adjusted operating income totalled €51 million, an increase from last year’s €21 million. TNT supports a number of charities with whom it has formed professional partnerships, such as the Breast Cancer Campaign, the United Nations’ World Food Programme and the BBC Children In Need, where it focuses on providing support for young people. It donates tens of thousands of pounds to its chosen charities, as well as raising general awareness and providing resources, and has raised in excess of 3 million for its primary charity partner Wooden Spoon, which helps disadvantaged children who are suffering from mental or physical illness. The company is also active in helping charities overseas, and has been Nuneaton Rugby Union Football Club’s main sponsor for over 17 years. Business customers who need stationary or packaging for their deliveries can obtain supplies from the TNT online shop. With an account login, a variety of supplies can be ordered and delivered to the business premises free of charge. TNT Supamail Subscription consignment notes can also be ordered. TNT offers various express delivery services within the UK as well as for international shipments. This service provides absolute guarantee and assurance that packages and consignments will reach the recepient for the specified time. TNT Direct is a new service from TNT that presents existing or potential customers with the option to make quick, hassle free shipment bookings, with just four steps involved from beginning to end. Using the service, customers can ship to anywhere in the world without registering an account, significantly speeding up the booking process. Delivery quotes on individual parcels or consignments can be obtained instantly by entering the collection and delivery addresses along with the dimensions (height, width, length) and weight of the items being sent. Parcel collections booked before 1pm via TNT Direct are typically collected on the same day, with collections taking place between 9am and 5pm on Monday to Friday. While focusing primarily on ease of booking, fast service and reliability, TNT Direct is also all about security and flexibility and prides itself on having the facilities and resources to meet the individual needs of its customers for whom it tailors its services when requested and where possible. TNT Direct utilises the company’s access to the best in road, air and rail networks to provide the best service possible, provide expedited shipment options and ensure that delivery needs are met. This makes it an ideal and trustworthy choice for those needing to guarantee a parcel reaches the recipient quickly and at short notice. TNT Direct’s couriers aim to deliver any domestic shipments sent through the service at the earliest possible time the following day, however for packages that require guaranteed early delivery, the following time slots are available, amongst others. For more options or specific requirements, customers can talk directly to a member of the Direct team. International shipments can be made through TNT Direct to Australia, Belgium, Canada, China, France, Germany, Greece, India, Italy, Spain and the USA amongst others. Over 200 countries are covered by the network in total, including harder to reach destinations such as the Middle East. Next day delivery is available for most countries within Europe, with specific delivery date requests being possible for those outside of Europe. Customers benefit from the company’s vast experience in making international deliveries and getting through even the most demanding customs as quickly as possible without incurring additional or unexpected charges. Live chat and support is available throughout the process. TNT have developed a mobile app which enables customers to quickly and easily track and manage any shipments sent through the company when they are on the move or away from the office or home. The app works on most mobile phones and simply requires an internet or WiFi connection to function. Through it, users can access a number of features that are available on the standard website, including track and trace. This means it is possible to follow a domestic or international shipment’s progress at all times and from anywhere in the world. In cases where mobile internet access is not available, for example when travelling abroad, customers have the option to request regular updates on any number of consignments or shipments from TNT via text message. The SMS service automatically sends any new information on the progress of a package and will even let the customer know when it has been signed for. To activate the SMS service for UK national shipments, text the letter ‘C’ followed by the consignment number, or ‘R’ followed by the customer reference, to 07770 777 177. To track international shipments via this service, text the same information to +44 7860010203. TNT is a huge company that employs people all around the world, with jobs available in over 60 different countries. Many jobs and careers are available, from couriers and drivers to high up management positions, with the option to opt for a more temporary short term job or one with long term career prospects. Positions with the view to a career are varied and cater for many different skills and levels of expertise. Amongst the departments constantly recruiting new staff are Security, Finance, Human Resources, Marketing, Sales, Law and Communications. Many of these positions are ideal for recent graduates looking for a secure job where they have the opportunity to progress and grow, and there are Head Office positions available for those who are more qualified and have many years of experience in the field. 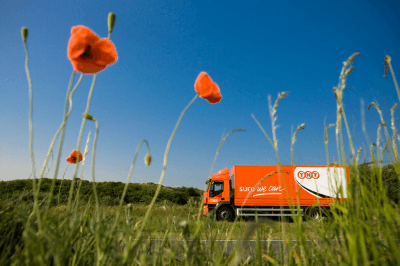 These jobs are available all over the UK, with many of the more long term careers being based at the TNT Express Head Office in the Netherlands, where many exciting positions and opportunities are presented. Interested parties can contact the Head Office recruitment team on +31 (0) 88 393 9000, or email gho.hrheadoffice@tnt.com. Current vacancies, regional, local or international, can be searched for online using the TNT Vacancy Search. They can be filtered according to country, job level, functional area, working time, contract type and education level. While the customer will always be the priority for TNT and its employees, the company puts a strong focus on its workforce and takes measures to ensure that they are receiving the very best treatment. This makes it one of the finest companies to work for, and the benefits provided and opportunities afforded to the staff are endless. Employees are encouraged to constantly develop their skill sets and grow within the company and as people, with feedback, evaluation and necessary training being provided throughout their careers. Opportunities to advance within the companies are frequent, with jobs advertised internally and in house scouting for vacant management positions, where the most impressive employees best suited to particular roles are scouted by members of the resources management team. To motivate the workforce, TNT often provide financial rewards based on performance. As well as this, awards are given to outstanding staff members, recognising their efforts and performance, along with a number of special programmes and rewards throughout the year. There are a few different ways to get in touch with a member of the TNT team, with the main option being through the Help & Advice section of their website, where a plethora of frequently asked questions are answered and general information is also provided. To enquire about a quote, account holders can use their MyTNT account or call 0800 100 600. Non account holders must call the same number to open an account, or simply use the TNT Direct service which does not require sign up. The same number can also be used to book, rearrange or discuss collections, as well as any general concerns. For deliveries that require something more than the usual service or for those that are especially urgent, TNT have a separate phone number, 08451 247 365. This phone line deals sspecifically with special services and is open 24 hours a day, 365 days a year. To take advantage of this service, customers must sign up for a special account. TNT have depots all over the UK which can be contacted directly to deal with enquiries on a more personal basis. Locations of the TNT Depots can be found on the online location address finder, where specific addresses and phone numbers for each are provided. There is also a postcode finder where customers can search for their nearest depot using their postcode. Complaints can be made by filling in a form on the TNT Help website, where the customer can enter their contact details along with their account number, the consignment number the complaint is referring to and any comments that they have. Compliments to the team can also be sent via a separate form on the same website.